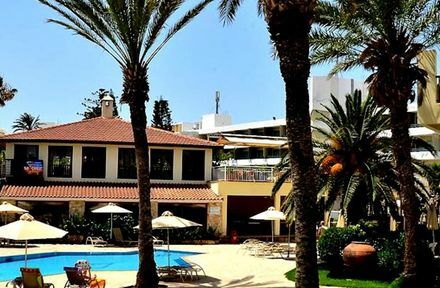 The Panareti Paphos Resort Hotel is superbly situated within easy walking distance of the harbour and Paphos castle in the southwest part of the Island paradise of Cyprus. Booked through Travel Republic who then passed it onto Jumbo Tours, I rang the hotel five times and I am still not booked in which is for tomorrow. I have already paid Travel Republic and they have stated its been left with Jumbo and have not returned there enquiries..
Panareti Paphos is located in a large tourist area by the beach. It is a little run down in places and is in need of refurbishment. We stayed in a flat with a large living area and kitchenette plus bathroom downstairs and 2 double bedrooms upstairs. The kitchen had a fridge, microwave oven, cooker top, toaster, sink and some utensils. There is a restaurant which serves breakfast and dinner on half board basis, food is good. The hotel is a short walking distance from the beach. There is a swimming pool for adults and small pool for children and also a fenced-off play area. Paphos tourist area is really designed with foreign visitors in mind and it has all kinds of shops within walking distance. We hired a car and driving in Cyprus is really easy if you are used to driving on the left. There are many tourist attractions, archaeological sites and monasteries to visit.